ThemeParkMama: Enter to #Win a $45 Gift Card to #BostonMarket! Ends Jan 6th! Enter to #Win a $45 Gift Card to #BostonMarket! Ends Jan 6th! I love deals like this now that the holidays are over I look for ways to save big and giftcardmall is the best way to get the most for your money. While you may not have heard the name, you've certainly seen Gift Card Mall end-caps and kiosks in your local Safeway, Kroger and other grocery and convenience stores. 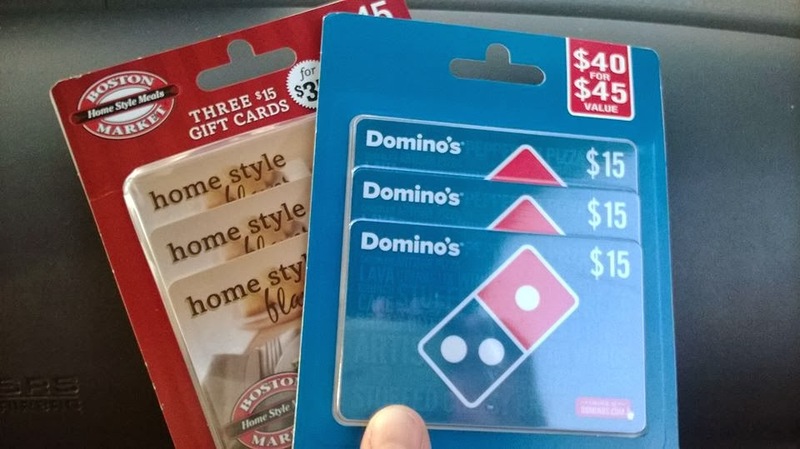 They offer a huge array of gift cards to choose from, and when purchased from a grocery retailer, consumers can receive special deals, including money off a gift card, and gas savings. Still want to buy that sweater at GAP, instead of giving a gift card? Go for it! But, buy the gift card at Safeway first, so you can save $10 instantly - then head over to the GAP to purchase the sweater with your $50 gift card, that you only paid $40 for. Enter to win a $45 Gift Card to Boston Market. Contest will end Jan 6th! Open to U.S. residents only. I don't see any current deals listed on the site, however I like the Bonefish Grill gift card and the fact that you can save on gas. I think the BP gas giftcard is a really good deal. I like the Visa gc. You can use it at mostly anywhere. I would buy an Applebee's Happy Birthday! Gift Card for my friend. The E gift card is the best deal. I like the , Save $10 when you buy 2 gift cards, deal. The amazon gift card is the best deal. The Starbucks card is the best deal! I like the Amazon egift card. I would choose the 70% to Amazon. The saving $10 at gap. I shop there all the time, so it would be the most useful to me. I don't see any deals but I love the Starbucks GC. The best deal to me is the Kroger deal. I already buy gift cards there around the holidays because of the fuel points, so I love that you get $10 back. There aren't really deals. But I like the Amazon gift card. I think the Kroger deals are the best, I use their rewards plan. I like the Amazon cards - because the possible uses are so wide-ranging. Wow that's a no brainer, head to Safeway first, 10 bucks is 10 bucks!!! I can always use a Amazon card. Def. the Amazon gc. You can use them on anything. I like the Old Navy GC deal! The best deal for me is Amazon. I like the Visa gift card. I've used in the past and have had no problems. There was not any deals listed. I like Starbucks and restaurant cards to give as gifts, they are always appreciated. I like the Safeway deal. I like the Amazon GC. I like the deals they have for movie theaters. I would say the Visa gift card. I think the Amazon is the best deal. Amazon or Visa, so versatile. I like the amazon gift cards because you can buy most anything with them! The amazon card is one that has the most value for me. I buy so much on Amazon. I like the Amazon gift card. I love the amazon gift card deal! I really love Amazon so I would have to go with them! I would like the Visa gift card because you can choose where to shop and aren't limited to one place. Amazon - they are a great deal and have almost everything. Visa GC is the best. I like the Applebee's Graduation! Gift Card. The Amazon gift cards are the best deal to me. I didn't see any deals but the Visa card would be great since it can be used about anywhere. I went to the website, but I honestly do not see any deals. It appears that all the gift cards I check out do not appear to have any bonuses. However, if I were in the market to buy gift cards I would purchase Amazon and Target. The Visa card is always a good deal. I like the Kohl's and Craker Barrel GC. The eGift cards are the best deal. The Toys R Us gift card. I like the ecards, especially the American Eagle Ecard. Starbucks cards are always the best deal. I think the Starbucks card is a good deal. Amazon g/c, for sure! So many options! I think the Amazon gift card is the best deal. I like the Best Buy gift card.